This is a custom Steven Khalil based off his 'Jazlyn' gown, worn once (for 9 hours) in October 2015. 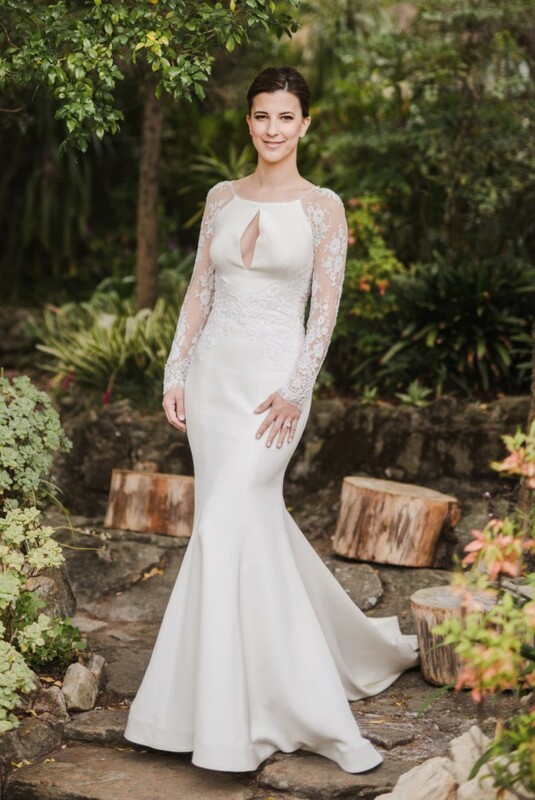 Long sleeved, sophisticated silk and French lace gown which features a boat neckline, and slim keyhole bringing a modern twist to a classic look, whilst being incredibly comfortable to wear. Back of the gown features a keyhole split from nape to lower back, with delicately cut organza and french lace, fastened with buttons. Buttons also feature on the cuffs on the sleeves. Comes with sewn in bust cups which fit a B/C cup and a chapel length train which bustles in the back to take you from alter to dance floor in a cinch! The hem of the gown skims the floor on a 170cm bride with 10cm heels. Professionally dry cleaned and comes in it's original Steven Khalil garment bag.